Superman vs. The Flash - who wins? The Man of Steel and the Scarlet Speedster square off! Limited edition 10 1/2-inch tall statue inspired by the Superman #199 comic. Sculpted by Alterton and Alejandro Pereira. 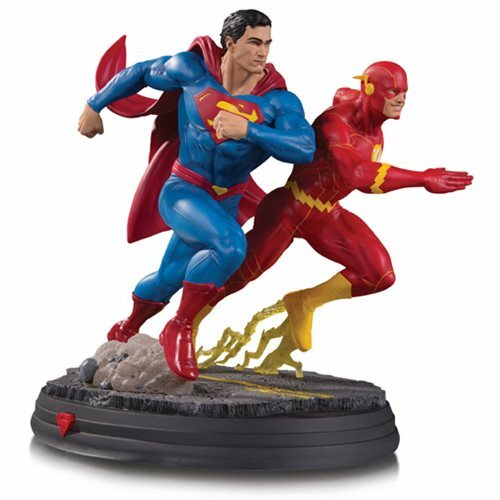 The Man of Steel and the Scarlet Speedster square off in this premium polyresin statue sculpted by Alterton and Alejandro Pereira and inspired by the classic Superman #199 comic. The question is, who wins? The answer is, you do with this sensational DC Gallery Superman vs. The Flash Racing Statue! It's a limited edition of 5,000 pieces that measures slightly under 10 1/2-inches tall. Ages 15 and up. SPOILER: Who Is the Fastest DC Superhero?